The gospel of John seems to have Jesus observing the feast but in a dispute on Hanukkah. 22 At that time the festival of the Dedication took place in Jerusalem. It was winter, 23 and Jesus was walking in the temple, in the portico of Solomon. 22: Festival of the Dedication, Hanukkah (beginning on 25 Chislev, a date that [usually] falls in December), commemorating the rededication of the Temple (164 BCE), after it had been desecrated by the Seleucid king Antiochus IV (1 Macc 4.52-59). It is unclear clear [sic] how this feast was observed in the first century. 1 Now Gorgias took five thousand infantry and a thousand picked cavalry, and this division moved out by night 2 to fall upon the camp of the Jews and attack them suddenly. Men from the citadel were his guides. 3 But Judas heard of it, and he and his mighty men moved out to attack the king’s force in Emmaus…. 58 There was very great gladness among the people, and the reproach of the Gentiles was removed. 59 Then Judas and his brothers and all the assembly of Israel determined that every year at that season the days of dedication of the altar should be observed with gladness and joy for eight days, beginning with the twenty-fifth day of the month of Chislev. There’s some odd gospel Greek here that seems to be lifted from the Greek of the Septuagint, of Maccabees. What the NRSV translators make “the festival of the Dedication” in the gospel is their rendering of ἐγκαίνια; and what the translators make the days “of dedication” in 1 Maccabess is their rendering of ἐγκαινισμοῦ. In the entire New Testament, and in the gospel of John, the phrase never appears again. There are a number of odd Greeky things here. And without ado let’s get to them. First, Greek readers see how Jesus is in a dispute with οἱ Ἰουδαῖοι as if he’s not one of them. 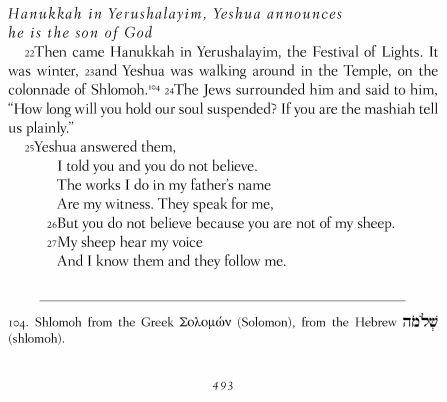 We notice this in particular because in 1 Maccabees 4.2, we read that Ιουδας is leading those in the camp “of the Jews,” or τῶν Ιουδαίων, as opposed to the others of “the Gentiles,” or ἐθνῶν. The NRSV translators make him into the English transliteration Judas, when we all know it refers rather to יהודה המכבי, which could be instead transliterated Y’hudhah HaMakabi or Judah Maccabeus. In the gospel, it would seem that Jesus and the Jews are in opposition, and there’s a different Judas, and not a hero, who ends up betraying him. And who knows where that leaves Jesus in the end, among the Jews or the Gentiles? What an odd mix. The Greek is odd. The Greek lifts from the Septuagint. That Greeky older bit is purely a Jewish account, whosoever’s canon might tolerate it. And much of the Hebraic and Jewish nature of the text, of the odd gospel Greek, gets lost. There are a few translators who have tried, nonetheless, to restore what others have lost. David H. Stern, “an American-born Messianic Jewish theologian of Israeli residence,” offers one. Another is offered by another Messianic group in America. 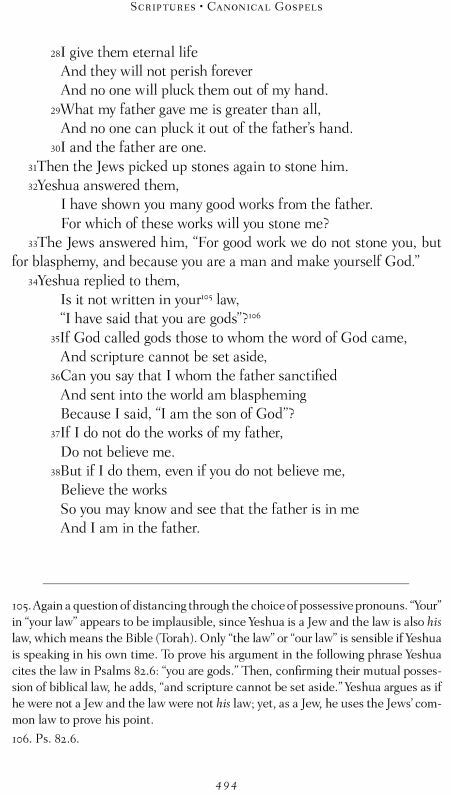 Biblegateway.com posts both of these, and you can click here to view them. I love what you’re doing here, Kurk. First of all, I’m embarrassed to say I had no idea that the Feast of the Dedication was Hannukah. Although that is noted in the NAB footnote on the term, the footnote doesn’t make it into the lectionary reading! So Jesus said again, “Amen, amen, I say to you, I am the gate for the sheep. All who came [before me] are thieves and robbers, but the sheep did not listen to them. I am the gate. Whoever enters through me will be saved, and will come in and go out and find pasture. A thief comes only to steal and slaughter and destroy; I came so that they might have life and have it more abundantly. which now reads to me rather as an anti-political/military/nationalistic text. I love all those connections to the peripatetic school and the Greeky style of education — especially pisteis, good grief. That adds so much con-text to this text.